So many people in your audience will have an interest in the life of a magician and this can be used to your advantage when you are performing. Most people seem to wonder, at one time or another, what magicians actually do? They want to know where they find the knowledge to perform their tricks, what sleight of hand looks like ect. This is still a mystery to so many people. By telling your audience that you are going to let them in on one of the key principles of magic, it is my experience that the majority of people will be interested enough to stop whatever they were doing and listen in. This misdirection lesson works off this phenomenon. You begin by asking if anyone has ever thought about how to learn magic? No matter what the response is to this question, you tell them that you have to first learn the foundations of magic. I find that generally someone from the crowd will generally chime in and knowingly say ‘misdirection’. You then move in closer, as if you are going to let them in on a secret, and you will teach them how it is done. 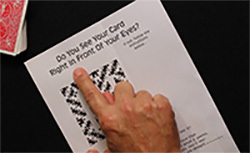 Using the optical illusion’s visually compelling properties, we are going to draw the audience’s attention away from the real secret to the magic trick. You can download the illusion and some added extra bits by clicking the download button on this article. Misdirection can be very complex but in it’s simplest form it is essentially diverting a subjects attention away from the what is going on in secret right in front of them. It gets theoretically far more complex from there. 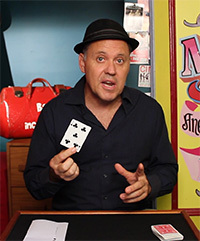 To successfully complete this misdirection lesson trick, you will have to be able to force a card upon your audience. In other words, make your audience member take the card you need them to take. Did you enjoy this Misdirection Lesson Trick? To learn more simple magic tricks Click here! Do you have a lesson on Forcing a Card? So where is forcing the card exclamation?